Petra Kaufman, MD, MSc, director of the National Center for Advancing Translational Sciences (NCATS) Office of Rare Diseases Research, speaks during the Advancing CEnR 2017 Conference. All too often, community and research are disconnected. Clinical studies move forward with little to no input from the populations they impact, and local voices are left out of the conversation. The Advancing the Science of Community Engaged Research (CEnR) Conference — held at the Association of American Medical Colleges (AAMC) in Washington, D.C. — intends to change that. Meharry Medical College (MMC) and Vanderbilt University Medical Center (VUMC) hosted the conference for the second year in September. It provides a forum for Community Health Workers (CHWs), clergy, advocates and other community stakeholders to meet with medical researchers on a national platform. “There is still a crucial need to engage communities in research,” said Meharry-Vanderbilt Alliance (MVA) Executive Director Consuelo Wilkins, MD, MSCI, who chaired the conference organizing committee. 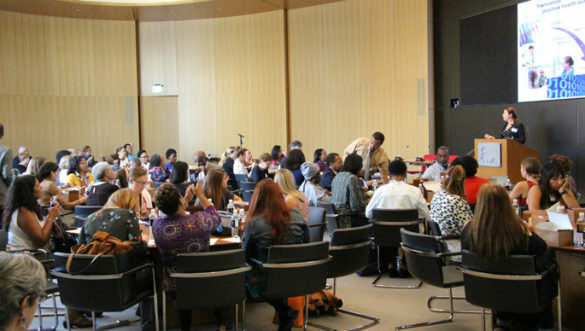 More than 200 people attended the conference, which empowered community stakeholders to interact and work with researchers. Support from the National Center for Advancing Translational Sciences (NCATS) and the National Institute on Minority Health and Health Disparities (NIMHD) made it possible for 20 Community Scholars to attend. The Scholars, who represented community groups ranging from faith-based associations like Apostolic Faith Church to advocacy organizations like Latina Contra Cancer and Community Faces of Utah, met with national research leaders including NIMHD Director Eliseo Pérez-Stable, MD, and NCATS Office of Rare Diseases Research Director Petra Kaufman, MD, MSc. Pérez-Stable and Kaufman were featured speakers at the conference, and they discussed the importance of diversity in science and medicine as well as collaboration with communities across the entire research spectrum. “By attending the CEnR conference in DC, I was able to gain invaluable insight on how the community and the academic research community can work together to advance their work in addressing health disparities in our respective communities,” said Jeannette Gonzalez from Gilda’s Club in Chicago. Learning labs and think tank discussions served as “how to” breakout sessions, delivering practical guides about CEnR approaches. Learning Labs brought researchers in contact with community stakeholders to share insight and experiences. Think tanks, meanwhile, focused on emerging topics, allowing attendees to discuss new perspectives and ideas. Topics ranged from partnering with CHWs in research to using CEnR for health equity to engaging underrepresented groups.